Hull roughness reduction: Hull roughness is the result of fouling, corrosion, flaking of old paint, mechanical damages during service, etc. Taking care of the underwater portions of the hull is all about minimizing roughness. This can be achieved via smooth surface finish, more appropriate paint, more appropriate operation and more appropriate hull and propeller maintenance. In order to minimize a ship’s frictional resistance, the owner must address both physical and biological roughness. There should be a smooth surface to start with and it should be maintained at proper intervals. Mechanical damage and coating failures have to be addressed and fouling has to be controlled. Regardless of what system is selected to manage roughness, care should be taken to make sure the cleaning methodology is compatible with and compliments the coating system. Regardless of the type of coating, it is also worth noting that the amount of fouling can vary greatly with trading pattern and operational profile. Controlled Depletion Polymer (CDP) – A traditional antifouling type based on water soluble natural or synthetic pine rosin mixed with a biocide. An insoluble reinforcing polymer resin is added to create a skeleton to give the rosin better mechanical properties. The controlled dissolution of the rosin matrix releases the biocides. Over time a build-up of insoluble materials at the surface in a leached layer slows the release of biocide and makes recoating difficult. Moving water (or cleaning) is required to wear off this resin skeleton and release the next layer of coating and biocide. Typical life before recoating is 3 years, but because of the build-up of this leached layer and reduced biocide release micro fouling (green slime or weeds) can become a problem in less than two years. The average hull roughness increase is estimated at about 40 µm per year in surface profile, but this can vary greatly. Self-Polishing Copolymer (SPC) – An insoluble metallic or organic synthetic polymer (e.g. copper-acrylate or silyl-acrylate) that contains a biocide. Through a chemical reaction – hydrolysis – the polymer becomes soluble. Its subsequent dissolution releases the biocide. The chemical reaction provides good control of the rate of dissolution and results in a much thinner leached layer and smoother surface profile than possible with CDPs. No ship movement is required as there is no residual ‘skeleton’ and the surface is actually self-smoothing. Five years of service for high quality systems can be achieved. Average hull roughness increase is estimated at about 20 µm per year. Foul-release Coating – A biocide-free coating that uses non-stick properties to control fouling. It is usually silicone or fluoro-silicone based and designed to shed any micro or macro growth when the vessel is underway. For slower vessels (less than 15 knots) this is a challenge for even the best coatings so some ‘soft’ cleaning is usually required to remove the micro fouling. 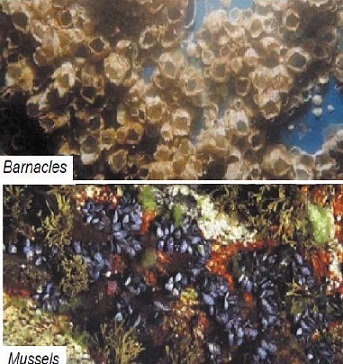 If the vessel is stationary for some time, barnacles and other macro-size biota can become attached. Achieving a full release of all fouling through ship speed impact has proven to be a challenge in some cases. The coating gains some of its effectiveness from its extremely smooth surface and this must be maintained for best performance. Roughness in a foul-release coating will reduce its ability to discourage adhesion and slime/ micro fouling can take hold. Mechanical damage from example from tugs is especially critical for these types of coatings requiring special care in operations as the damaged parts has no fouling protection. Average hull roughness increase is estimated at 5 µm per year, but this is based on a very limited service experience. Cost: The more effective anti-fouling coatings tend to be more expensive. Speed of vessel: Fast vessels such as HSC tend to have harder coatings. Fresh-water or salt-water: The coating quality should be chosen accordingly. National regulations: Some types of anti-fouling paints are banned in certain countries. Area of operation: Severity of fouling in area vessel is trading, some sea areas are much worse than others. When searching for the best hull coating, it is important to consider a coating that provides a smooth surface that can be reasonably maintained in its smooth state, and that prevents adhesion of fouling organisms. Also, the coating must be applied properly, monitored and managed to maintain its best qualities. Since the banning of TBT (Tributyltin) based on “The International Convention on the Control of Harmful Anti-fouling Substances on Ships, 2001”, most anti-fouling coatings are self-polishing copper and tin based paints but it should be borne in mind that some countries are either banning or considering banning the use of copper based paints in certain areas particularly in inland waters. Biocide-free silicon-based coatings are also available but their market share is very small due to their high cost. These coatings are commonly referred to as “foul-release coatings” as they have a soft surface onto which it is difficult for most organic growth to hold. Research has shown that these new coatings are equally as effective as TBT-based systems but there is still some debate and not everyone is totally convinced. In general the more advanced products do yield better results, however if a particular ship operating in a particular area, is getting fouled up faster with one product, it is worth considering changing to a different one. It is also worth talking to other ship operators in the same area and asking which produce works best for them, as they can give unbiased advice which one may not get from an original vendor. Regular in-service cleaning to remove fouling organisms is clearly beneficial unless it is carried out in a way that results in a damaged coating or a ‘roughed’ up surface. From a fuel efficiency point of view, the emphasis should be on hull and propeller “roughness” management and not just on the control of “fouling”. A proactive approach that pre-empts any type of widespread macro fouling is always recommended simply because the cost of having such fouling present outweighs the cost of cleaning by a very large margin. Regular cleaning of micro-fouling is also often cost effective if the proper cleaning technique is used so that the surface roughness is not degraded and coating material is not removed. For best results, the scheduling of cleaning should be based either on monitoring of performance indicators (like power versus speed) or on regular pre-cleaning inspections. In both cases a threshold is established that identifies when cleaning is economically justified. For visual inspections the threshold includes the percentage of the hull surface that is fouled and the type of fouling. Regular inspection, photographs and roughness measurements would be a prudent way to monitor the impact of cleaning and the condition of the coating. Use of underwater cleaning techniques and equipment should be done with care and with due consideration to original coating as well as amount of fouling. For example, removal of macro size fouling is difficult to be done without removing a significant amount of paint. If the antifouling is applied in different colour layers then these colours can be used to monitor paint removal during cleaning. In general, SPCs have a thinner leached layer than CDPs so the cleaning should use a less aggressive technique. Cleaning of foul-release coatings should only be done with a light touch and soft pads. In all cases, the advice of paint manufacturer should be followed, cleaning aspects should be reviewed with the cleaning company and condition before and after documented with good underwater photography of the cleaned surface. Cleaning a light slime can yield up to 7-9% reduction in propulsion fuel consumption. Cleaning a heavy slime could give 15-18% and cleaning of a macro heavy fouling up to 20-30%. Hull cleaning by divers can cost about US $1.5 to 2.5 in the Far East. This could convert to US $50,000 for a full hull cleaning for a VLCC based on ABS’s guide written in 2013. Of course, there is always no need to do a full hull cleaning, thus reduce the time and cost of hull cleaning but everything must be carried out with due care for the preservation of the coat system; otherwise things may give negative results. Regulations: When planning for hull cleaning, it is also important to be aware of other regulatory instruments that govern the coating system. The IMO at its MEPC meeting in July 2011 adopted, as a voluntary instrument, the MEPC.207(62) resolution on “Guidelines for the Control and Management of Ships’ Biofouling to Minimize the Transfer of Invasive Aquatic Species”. This asks for a Bio-fouling Management Plan and a Bio-fouling Record Book to be on-board. It is clear that while the proposed regulations undoubtedly will lead to added cost for ship maintenance and operation, it can also reduce the hull drag and fuel consumption if it is well managed with consideration for selection and maintenance of best coatings, and as such result in reduced total cost. Also, as indicated, there are local regulations that ban certain type of anti-fouling coatings that also need to be taken into account. Area of operation: Anti-foul hull coatings used on seagoing vessels are generally designed for saltwater and ships that spend extended periods in fresh water or brackish water will tend to foul quicker. If a vessel is going to operate in fresh water on a particular charter for some time it will be worth considering reducing the hull cleaning period or changing the type of anti-foul paint used. In winter when the temperature of the water drops below a certain level, fouling of the hull is reduced but will increases in the summer months when the temperature of the water rises. In temperate zones the maximum fouling occurs in late spring though to early autumn. An in-water inspection of the hull in the summer month may be beneficial for ships operating in such conditions such as short sea passenger ships. In water inspections: Regular in water inspections of the hull or dry-docking is the only certain way of assessing what the condition of the hull coating is. The speed and power output of the vessel should be continually monitored to establish if fouling is reducing the vessels performance. This can help the ship operator decide what the in- water cleaning or dry docking interval should be. The condition on the hull should be assessed regularly in line with the period detailed by the company and this period my need may need to be reduced if substantial fouling is evident. If a ship is laid up for any period of time an in-water survey of the hull is advisable and if the fouling is significant the ships hull should be cleaned and the anti-foul reapplied. Hull cathodic protection system: The installation of a hull cathodic protection system should also be considered and as it can reduce the corrosion of the hull. Corrosion will increase the hulls friction and resistance to the water flow past the hull and thereby increase fuel consumption. It has the added benefit of reducing pitting of the hull plating which reduces the strength of the hull. Lay-up: If a ship has been in lay up in a high fouling area for a long time it may need to be taken to dry dock to be cleaned before it can be put into service. When laying up a ship for any period of time it is worth considering where the ship is going to be moored and if possible avoid an area that is subject to high fouling. 1. “IMO train the trainer course material”, developed by WMU, 2013. 4. Munk, T and Kane D, “Technical Fuel Conservation Policy and Hull And Propeller Performance”, Royal Institute of Naval Architects Design and Operation of Tankers Conference, June 2011. 6. 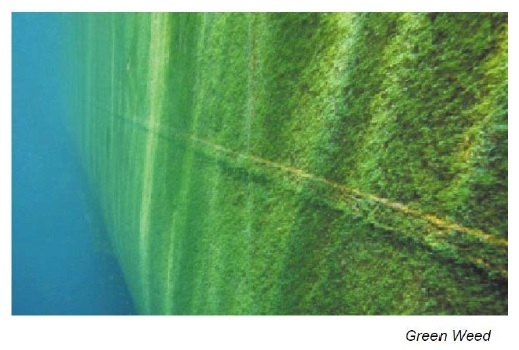 MEPC.207(62) resolution on “Guidelines for the Control and Management of Ships’ Biofouling to Minimize the Transfer of Invasive Aquatic Species”, 2011.